A low-key drama about an elderly woman living in a van, The Lady In The Van starts and ends with its title. It's the 1970s in England. A ragged lady known as Miss Shepherd (Maggie Smith) and whose first name may be Mary or maybe Margaret shows up in the London neighbourhood of Camden. She parks her van on the street and proceeds to live in it, moving location from time to time to avoid pushing any one neighbour over the limit of tolerance. Author Alan Bennett (Alex Jennings) lives on the street and is the most sympathetic, although still disgusted by Miss Shepherd's filth. When new parking restrictions are implemented, Bennett begrudgingly allows the lady to park her van on his driveway for a few months. She stays there for 15 years, with occasional visits from social workers. Bennett learns little about his squatter, other than she used to attend a strict school run by nuns, and she used to be decent piano player. An intimidating man periodically drops by, demanding money from Miss Shepherd. 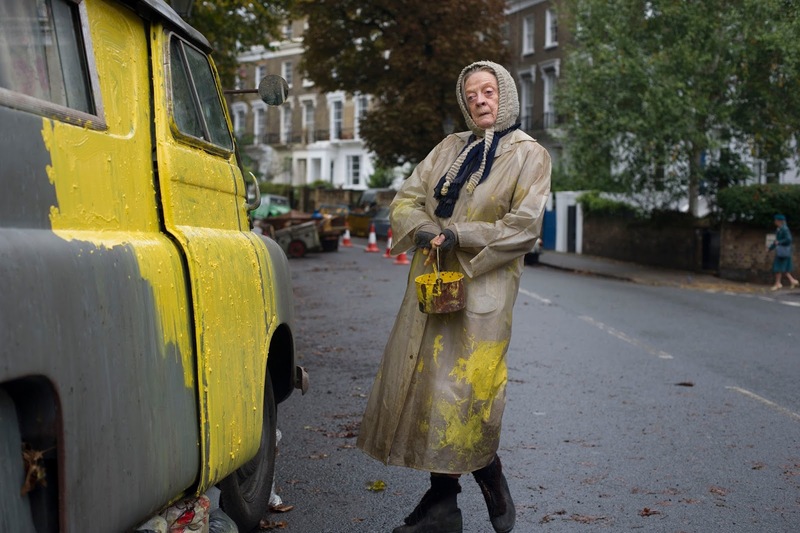 Directed by Nicholas Hytner, The Lady In The Van is a television-level film at best, and even then it's debatable if this story is worth telling in any medium. Bennett's source book is about 100 pages long, and it's clear that other than a bland wave at English society's repressed eccentricity, there is nowhere near enough material for a 104 minute movie. The film establishes its premise in the first 10 minutes and idles for the remainder of the running time. 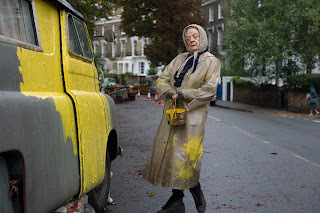 Miss Shepherd stinks, the neighbours are annoyed but not to the point of doing anything about it, she like to paint her vans yellow, and she has a vague history of routine broken dreams and perhaps a secret to keep. For the entirety of the film, no one actually does anything. Pretending that this story is anything special and worth producing a movie around is spurious in the extreme. Of course Maggie Smith gives it her all, but this is a relatively easy monotonal performance all about the crusty anger of an old and marginally deranged woman who does not care to play by any societal rules. Jennings is saddled with an unnecessary dual role, supposed to represent the author and the man, but only serving to reveal the story's level of dilution. The Lady In The Van parks and then dies.